The Double Barrel is Victory Ranch’s new 5-stand shooting facility located in a secluded area of our backcountry. With six strategically positioned clay launchers, you can try a variety of target combinations ranging from novice to challenging. 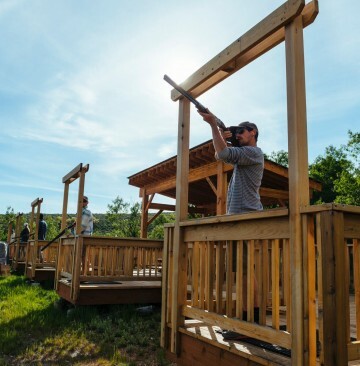 Whether you’re looking to brush up on your marksmanship before a hunt, or spend an afternoon shooting clays, you couldn’t find a more breathtaking setting for a shooting experience. Never held a gun? Not a problem. 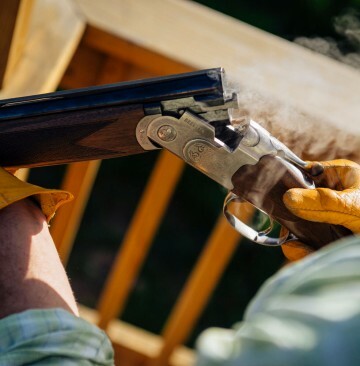 We’ll provide the shotgun and ammo, and one of our experienced Range Masters will show you how to safely load, aim and fire. 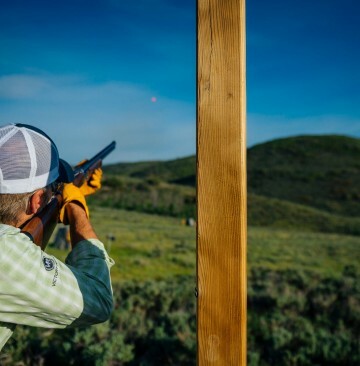 Before you know it, you’ll feel like a confident pro as you move from one stand to the next shooting clay targets. Next thing you know, you’ll be heading off to the backcountry for some upland bird hunting. Set in an idyllic spot two miles into the backcountry, the Double Barrel isn’t just a shooting stand in the woods. With a fire pit, hammock and picnic table nearby, it’s a wonderful place to spend an afternoon with family and friends. Let us prepare a picnic lunch for you as you test your skills shooting clays and enjoying the solitude of the backcountry.